Scadding Cabin, built in 1794, now located on the CNE grounds. Photo taken in May 2017. My first memories of Scadding Cabin date from the 1950s, when I was a teenager visiting the CNE. I had always been fascinated by history and was amazed to discover that the white-washed log structure dated from 1794. When it was built, Toronto was a frontier settlement of about a dozen log cabins, clustered around the eastern end of the harbour. The small garrison to the west of the town generated some economic activity, but most of it was created by fur traders that employed the Humber River as a trade route to travel to the Upper Great Lakes. When Upper Canada’s first Lieutenant Governor arrived in York’s harbour on the morning of July 29, 1793 aboard the HMS Mississauga, the sleepy settlement was thrust into sudden importance. Simcoe declared henceforth it was to be the capital of the colony. He changed its name from Toronto to York on August 26, 1793 as he preferred English names to those of the First Nations. John Scadding’s Cabin is the only surviving structure from this period in Toronto’s history, when log cabins were the only dwellings that existed. John Scadding (1754-1824) had been the manager of Simcoe’s estate in Devon, England. In 1792, when Simcoe was appointed Lieutenant Governor of Upper Canada (Ontario), Scadding joined him. Simcoe employed him as an assistant and granted him 250 acres of crown land, located on the east side of the Don River. The property extended from the shoreline of the Lake as far north as the first concession line (Danforth Road). Its east-west boundaries were the Don River and the Mill Road (Broadview Avenue). However, some historical records state that Simcoe ordered the Queen’s Rangers to construct the cabin, explaining why it was later referred to as “Simcoe Cabin.” Today, its location is where Queen Street East crosses over the Don Valley Parkway. The cabin was close to the river, which in the early years was teeming with fish, particularly salmon. The river was also a popular route for travelling to the town to purchase supplies and sell farm produce. Scadding’s first cabin was destroyed by fire in 1793. Fires were a common occurrence in these days because of open fireplaces with chimneys that lacked chimney-pots atop them. John Scadding erected another cabin the following year. Scadding returned with Simcoe to England in 1796, leaving the cabin under the care of a neighbour, George Playter, who lived in it along with his son. When Scadding returned to Upper Canada (Ontario) in 1818, he was married and had three sons. Requiring a larger residence, he sold the cabin to William Smith who employed it as a shed and small barn. Scadding erected a new home, barn and stables to the north, near what is today Gerrard Street. The abode was surrounded by orchards and cultivated fields of hay, rye, barley, and oats. In 1824, Scadding was injured by a falling tree and died shortly after, his sons continuing to operate the farm. As the 19th century progressed, the land to the east of the Don River was opened to further development. The land surrounding the cabin was to be subdivided and the cabin was in the way. In 1879, rather than demolish the cabin, Smith offered it to the York Pioneers free of charge, with the understanding that it would be relocated. The York Pioneers had been formed in 1869, by a small group of men intent on preserving York County’s early-day history. Its members were all pioneers who had been living in York County prior to March 1834, when Toronto was incorporated as a city. The men clearly remembered the town of York when it was a mere village, important only as a seat of government. 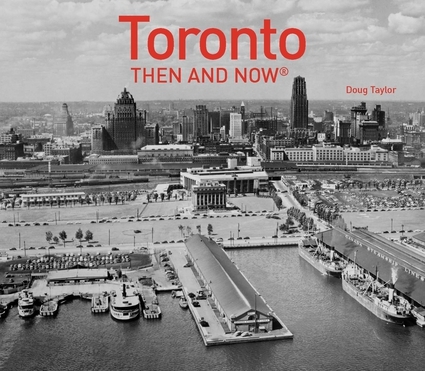 By the 1870s, Toronto was a bustling industrial and commercial centre. The relocation project was an ambitious endeavour that entailed considerable labour. The cabin was painstakingly dismantled, and on August 22, 1879, members of the York Pioneers met at Rennie’s Seed Store on Adelaide Street and journeyed westward in a cart along King Street. In the cart, pulled by a team of oxen, were the disassembled pieces of the cabin. They were on their way to today’s Exhibition Park, where they would re-erect it, using the tools and techniques of the past. It was the city’s first act of architectural conservation. The year 1879 was the inauguration of the Industrial Exhibition (later renamed the Canadian National Exhibition), and the cabin was to be a part it. The site where the cabin was to be reconstructed was to the west of where in the years ahead, the CNE Band Shell would be built. In 1901, the name of the cabin was changed from Simcoe Cabin to Scadding Cabin, to honour Henry Scadding, the youngest son of John Scadding. Henry was the author of the book, “Toronto of Old,” published in 1873. He is recognized as the city’s first historian. He was the president and a founding member of the York Pioneer Society. As late as the 1950s, the cabin was white-washed, but today it possesses the natural colour of the white-pine logs. It is furnished as a typical settler’s first house, with artefacts dating from the 1790s to the 1850s. Sketch drawn by Elizabeth Simcoe in 1793, depicting Scadding’s first cabin and a small barn. Scadding Bridge is on the west (left-hand) side of the two log structures. Toronto Public Library, r-1516. John Scadding’s second home on the east bank of the Don River, built around the year 1819. The lean-to on the right-hand side was constructed of planks from Castle Frank. They had been floated on rafts down the Don River. Sketch is from John Ross Robertson’s book, “Landmarks of Toronto,” Volume I, page 195. The Cabin (on the left) in the 1880s, prior to its name being changed from Simcoe Cabin to Scadding Cabin in 1901. Scadding Cabin in 1890, when it was on the CNE grounds. Ontario Archives, 10001932. A gathering at Scadding Cabin on the occasion of the opening of the CNE in 1907. Toronto Public Library, Fl 1244, item 0272. Scadding Cabin in 1928. Toronto Archives, Fonds 16, Series 71, Item 6099. Scadding Cabin in August 1972. Toronto Archives, F 1526, Fl 0094, item 0075. The north (right-hand) and east (left-hand) sides of the Cabin in May 2017. Views of the cabin’s interior with its stone fireplace. The northwest corner of the all-purpose room on the first-floor level of Scadding Cabin. An engraving of Simcoe is on the west wall. The narrow stairs that led to the sleeping quarters in the cabin’s loft. The ceiling is very low compared to those of today. The doorway of Scadding Cabin decorated to welcome visitors during “Doors Open Toronto” in May 2017.